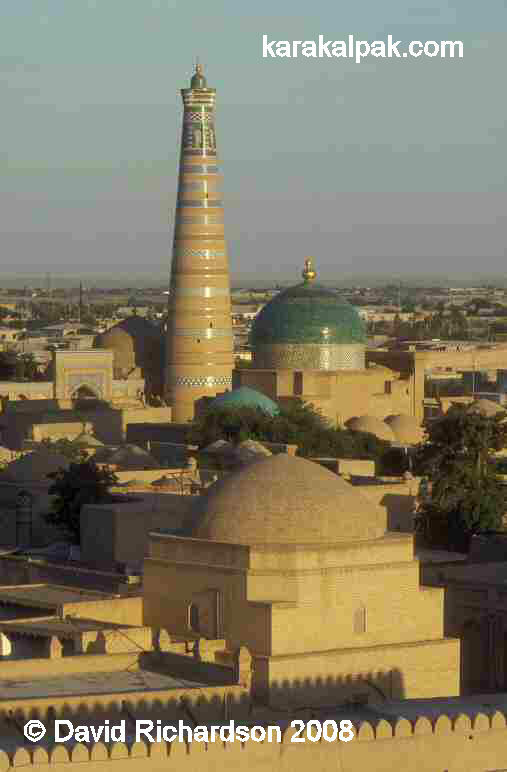 The Ichan qala, the inner citadel of Khiva, at sunset. Muhammad Rahim Khan (1806-1825) became one of the most powerful Khans of Khiva and immediately cracked down on the Yomut troublemakers, driving them out of the capital. He then set out to subdue the rebels in northern Khorezm and also to conquer the Karakalpaks on the Jan'a Darya. He began by assisting Aydos biy to establish a fortress at Aq-Jag'ıs, a strategic position on the Ko'k o'zek where the caravan route from Khiva to the Jan'a Darya crossed the river. In 1809 he set out with forces supported by senior Turkmen military leaders and conquered the Karakalpaks living between Qazaqdarya and the Aral Sea. In January 1810 his forces overwhelmed the Karakalpaks living close to the rebel Uzbeks and later that year they defeated the Karakalpaks on the left bank of the Amu Darya. The Qon'ırat arıs was now defeated and all the tribespeople were relocated to Xojeli. 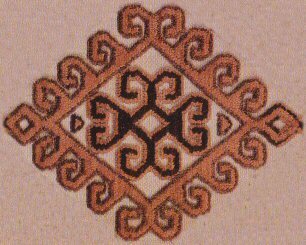 It is estimated that the Karakalpaks on the Jan'a Darya numbered 10,000 kibitkas, or households, mainly from the On To'rt Urıw arıs: 5,000 Man'g'ıt and Qıtay and 5,000 Bessarı, Qıpshaq, and Oymawıt from the Keneges tribe. The Khivans had already made an unsuccessful attempt to raid some of the Karakalpaks in 1807, and the Man'g'ıts had later taken Bukharan citizenship, although subsequent attempts to obtain military assistance from Bukhara proved unsuccessful. Meanwhile some of the other Karakalpaks and Yomuts sought protection under the Qazaqs. 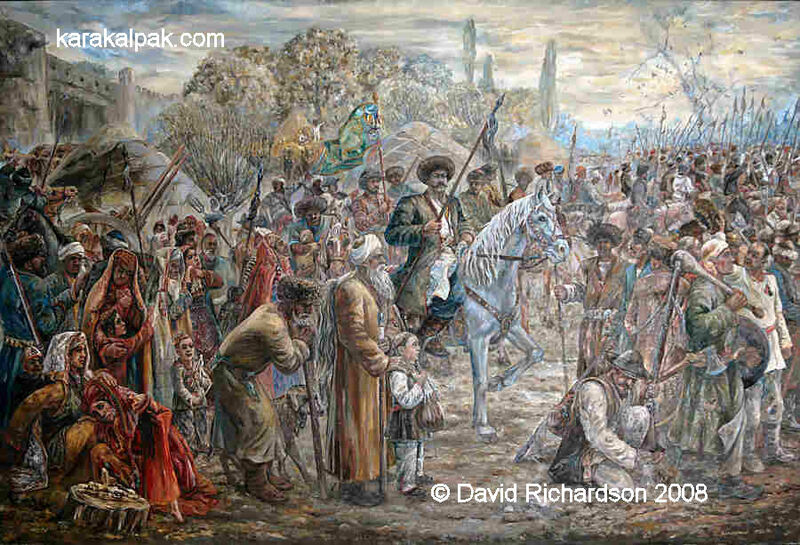 Muhammad Rahim Khan had sent a mixed force of Uzbeks, Turkmen and Karakalpaks to the Aq Jag'ıs fort, but once he got wind of the attempts to form an alliance with the Qazaqs he decided to accelerate his campaign and joined his forces on the Ko'k o'zek in December 1810. The leaders of the Man'g'ıt and Qıtay immediately submitted to the Khan and agreed to take Khivan citizenship, in return for which they were granted title to their wintering and summering grounds on the Ko'k o'zek. The others refused to submit and took flight along the Aral coast, while discussions continued with the Qazaq ambassadors. But the Qazaqs could not afford to upset their relationship with Khiva, and the remaining Karakalpaks had no option but to submit to Muhammad Rahim Khan. Now all that remained were the Aral Uzbeks and Chodor around Qon'ırat and the Khan took this region by force between 1810 and 1812. In the following years he also incorporated some Qazaq tribes on the Jan'a Darya and Turkmen tribes in the west into the Khiva Khanate. The Karakalpaks were now settled along both banks of the Amu Darya in the "badlands" of the delta region. The tribes and clans of the Qon'ırat arıs were mainly settled along the left bank from Xojeli to Shomanay and to the north of present Qon'ırat town, while the Aral Uzbeks occupied the region around Qon'ırat. The right bank was more heavily populated with Qıtay, Man'g'ıt, Keneges and Qıpshaq tribes. Further north the Ko'k o'zek waterway had been settled by Man'g'ıt, Qıtay and Bessarı tribes. There was a Qazaq settlement to the east of Taxta Ko'pir. Work began on the development of new agricultural oases in the delta, with the construction of canals, storage ponds, irrigation networks and shigirs for lifting water with bullock or donkey power. The Qanlıko'l oasis developed on the left bank, irrigated by the Laudan, Shomanay and other channels and the Qusxanataw oasis on the right bank, to the north-west of Shımbay, was irrigated by a branch of the Amu Darya. The Kegeyli oasis, fed by the Kegeyli canal, was also on the right bank to the south of Shımbay and was soon extended to link up with the Ko'k o'zek region further north. When a canal was constructed to Kunya Urgench in 1823, Goklen Turkmen were relocated to the new oasis formed to its west. It must have been appallingly tough work, freezing in the winter, mosquito-ridden in the spring and baking hot in the summer. Although Marxist historians have been responsible for documenting the history of this period and have been keen to emphasis the exploitation of the Karakalpak peasants, it is hard not to feel dreadfully sorry for them and the burden they faced in the 19th century. Many of their leaders had sold them out, offering compliance to the Khan in return for continued office and grants of land, while any bays who had offered resistance had been removed. The Karakalpak were ruled by an aristocracy consisting of bays (tribal chiefs), atalıqs, beglerbegs and merchants, and a layer of officials with qazıs (judges), rayıs (civil and religious police), mihrabs (waterways administrators) and military leaders. In addition there were the religious mullahs, iyshans and axuns and dervish shayıqs and xojas. The land within the Khanate was held in three forms: state land that was mainly granted on a hereditary sharecrop lease system, private land owned by the Khans, aristocracy and peasants, and vaqf land owned by the mosques and other religious institutions. Naturally the best land was allocated to the most senior Karakalpaks, who also owned the most cattle and had control of the canal system. Most peasants had insufficient land to support themselves � plots of arable land were not more than 1-2 tanaps (one tanap was 0.9 of an acre). Many peasants had to work for landowners in return for a share of the crop, some moving into southern Khorezm to work for Uzbek and Turkmen bays. Once they had scraped a meagre living from the land they were taxed by the Khan. Muhammad Rahim had not only imposed cattle tax (zakyat) on the Karakalpaks immediately after the conquest, but also burdened them with land tax (salgyat), and assigned responsibility for tax collection to their newly subservient tribal leaders. The Karakalpaks, like the Sarts, were therefore burdened with a higher rate of tax than the Uzbek or Turkmen residents of Khorezm. Non-payment of tax resulted in it being doubled! Ernazar Alako'z, nicknamed "big eyes", the leader of the 1856 Karakalpak uprising. Painted by Barlıqbay Aytmuratov in 1988-91. From the collection of the Regional Studies Museum, No'kis. It was a time of crisis for Khorezm � the civil war between the Uzbeks and Turkmen had devastated Khiva and the surrounding regions, and the wives and children of the warring factions had been taken into slavery. The instability had provided an opportunity for the Karakalpaks in Khorezm to rebel, with the Qon'ırat and On To'rt Urıw tribes uniting and encouraging the Qazaqs and Uzbeks from northern Khorezm to join their cause. When the insurgents appealed to the Qazaqs along the Syr Darya, the new Khan realised he needed to take drastic action and he negotiated a truce and alliance with the Turkmen leaders. The rebellious Karakalpak villages were routed and at a major battle near Xojeli, Sayyid Muhammad managed to defeat the combined insurgent forces, finishing off the survivors after a three-month siege close to the Aral coast. The local population were in a desperate condition, suffering poverty, exhaustion, huge price inflation, unreasonable taxation, instability and repression and in 1857 there was a major famine in the countryside followed by a cholera epidemic. Many Karakalpaks fled the Khanate to seek refuge in Bukhara, the Syr Darya and the Russian territories to the north-west. Appeals to the local authorities in Orenburg for protection achieved no response.